Leaving everything you are familiar with and going to a new destination could be the recipe for any manner of trip. Add in a program of relaxation designed to clear the mind and ease tension, healthy vegetarian cuisine, time in nature and exercise that restores you, and you have the makings of a Yoga Holiday. As commited students of Yoga, over the years of practicing we began to notice, with curiosity and awe, subtle yet profound awakenings in our daily lives. These shifts occurred on so many different levels, appearing spontaneously and increasing our connection to life and spirit, that we began to feel more happy and free. Stress is one of the most common diseases in the new world, people have to work everyday, go study, work at home,etc, Many doctors now recognize the benefits of yoga, and that by attending a yoga retreat (or many different retreats whenever possible) you can learn techniques that will lessen the likelihood of developing a stress-related illness. Short-term and long-term benefits of yoga include flexibility, physical strength and coordination, improved cardiovascular and neurological health through better breathing, and “staying younger longer” by maintaining a flexible and strong spine. Definitely Yoga is a great solution to restore your mind and body during your vacation. Return to your home as a new person , feeling relax and free. In front of beach, practice Yoga could be one of most relaxing experiences in the life, travel to Santa Teresa Beach, Costa Rica, one of the most beautiful ones.We in Pranamar Villas will help you to forget all problems , preoccupations and obligations. Throughout the year we will be hosting Yoga retreats and workshops with international teachers and our resident Yoga teacher. We offer all-inclusive yoga vacations that may be arranged and created according to your desires and needs, or simply drop-in for our daily classes taught by certified, professional instructors. 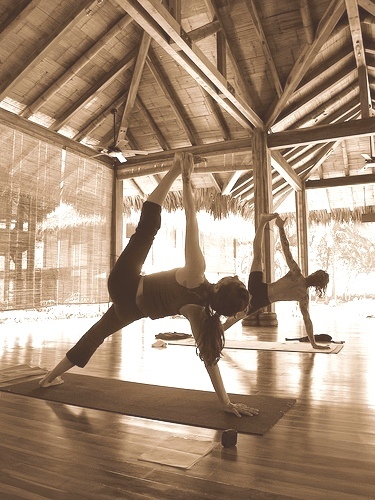 We offer all-inclusive yoga vacations, surfing and yoga holidays, or simply drop-in during your stay for daily yoga classes taught by certified, professional instructors. Rediscover your inherent connection with yourself and nature in the astounding beauty of Costa Rica with us!